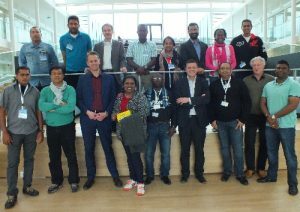 On 26 April, Reststoffenunie and KWR hosted 11 students and 2 supervisors from the Innovation & Technology MBA programme of the Surinamese Polytechnic College (PTC) of Paramaribo. This 18-month Master’s programme focuses among others on change management and the circular economy. The students are keenly interested in the development and realisation of projects to recycle substances from a variety of types of water as a means of contributing to the circular economy. The underlying notion is that sustainability and the entrepreneurial dimensions together form a good basis. Jos Boere (KWR) and Olaf van der Kolk (Reststoffenunie) spoke to the students about their organisations’ work. Arslan Ahmad (KWR) explained the research into the development of an adsorbent from sludge, a residual from the process of removing iron from groundwater. 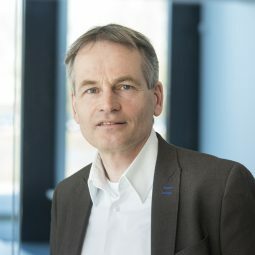 Ronny Theune (Reststoffenunie) spoke further about the development of Product/Market Combinations for two drinking water residuals: iron sludge and softening pellets.